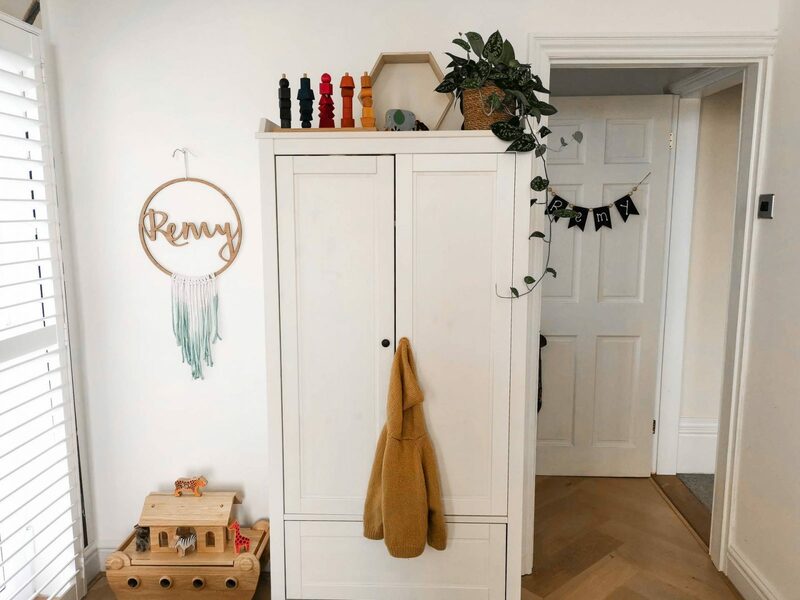 It may have taken just over a year but we finally finished Remy’s bedroom renovation and it looks better than I could have ever imagined… the perfect little boy’s room for a very cheeky little monkey. 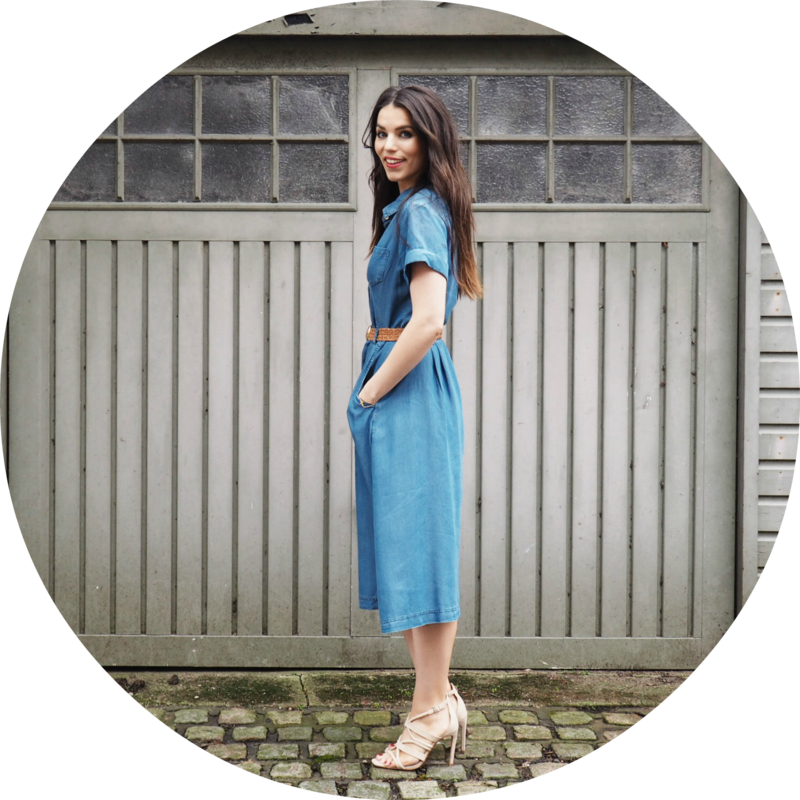 Just to mention if you prefer me taking you through the room on camera rather than you reading this post, then click below to watch the video! This blog post contains items that have been gifted to me over the years as well as items I have also bought. As ever, all thoughts and opinions are my own. I only blog about brands, products and services that I truly connect with, would genuinely use, and would legitimately recommend to others. 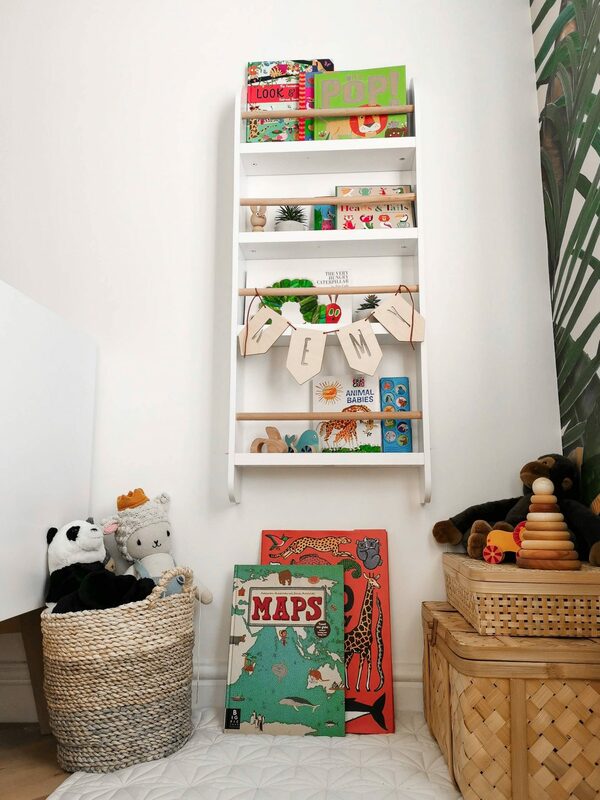 So where do you start when you’re thinking about decorating your child’s room? 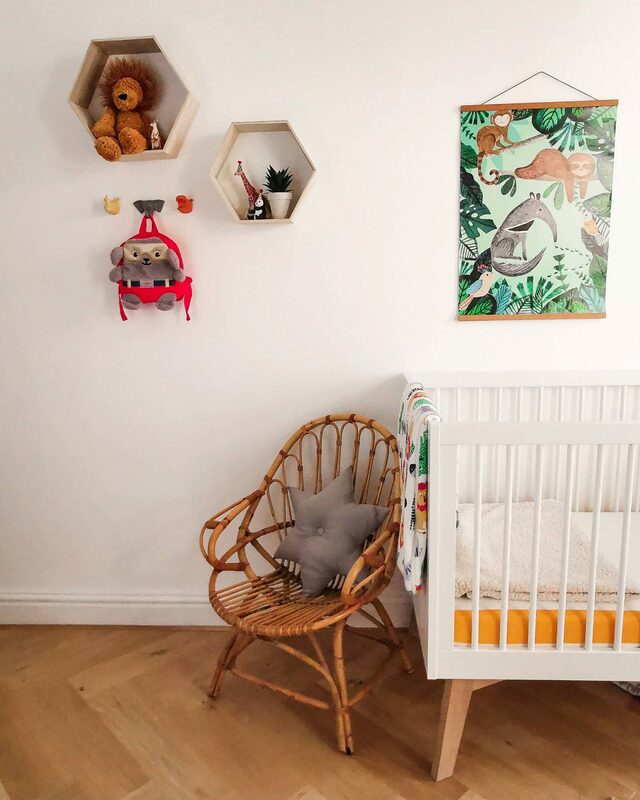 For me I wanted to create a space that he would love for a few years to come instead of opting for something more ‘infant like’. As soon as I saw this wallpaper when flicking through my Instagram feed, I just knew that this was it! 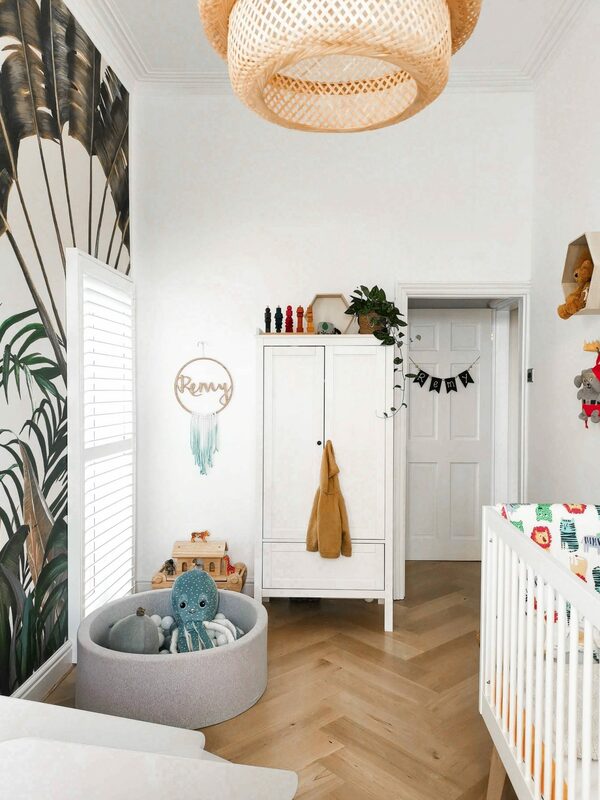 It was after choosing this wallpaper from Photowall – who kindly gifted it to us – that I was able to put together the whole look and choose other wall decor that would complement the space. 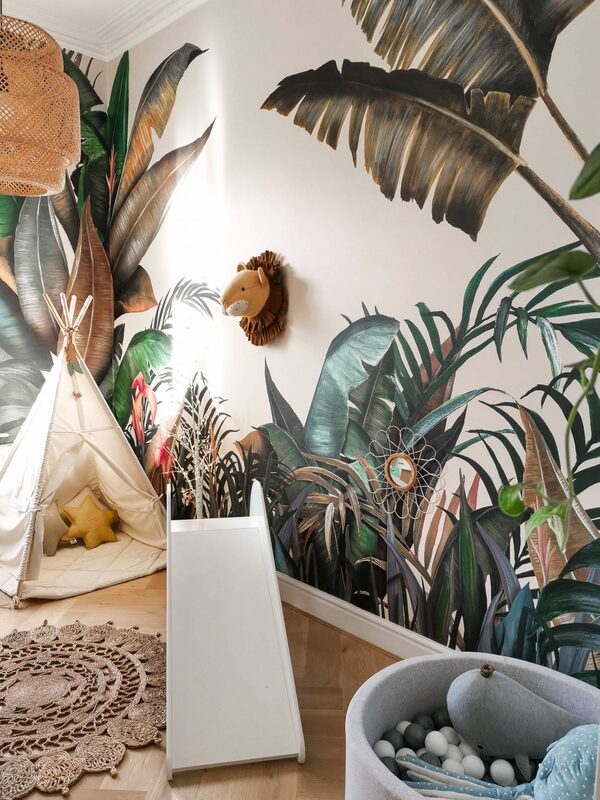 The theme we went for was a combination of jungle, animals and a natural wood kind of vibe with all the bamboo pieces. I feel like it’s the perfect space that will evolve with him over the years and we can easily change some of the decorative pieces to suit his changing interests and likes. If you know of my eldest son Hugo, you’ll know that he’s the biggest animal lover through and through. He knows more animals than me and I’m being serious! I did have a slight worry if he might end up preferring Remy’s room over his but they both really embrace each other’s room as a different play space for them. 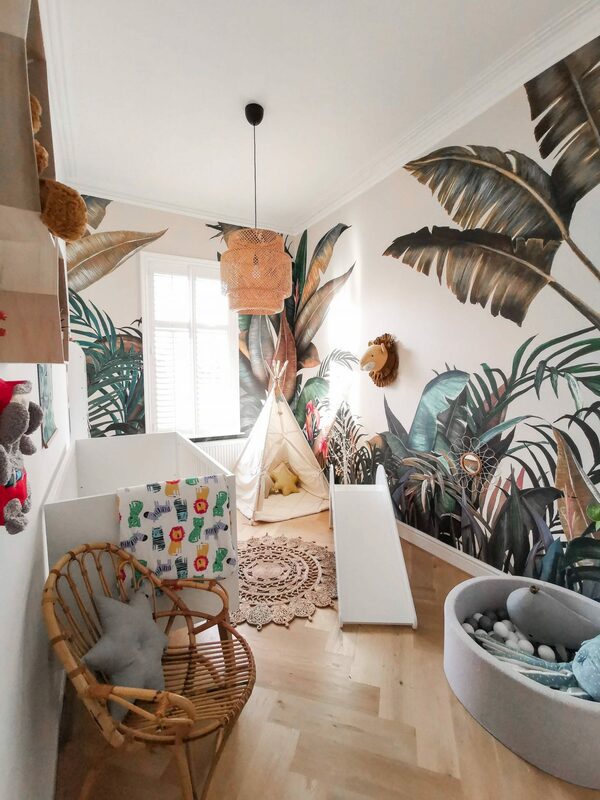 Hugo is obviously delighted to have an actual jungle room to play in now. 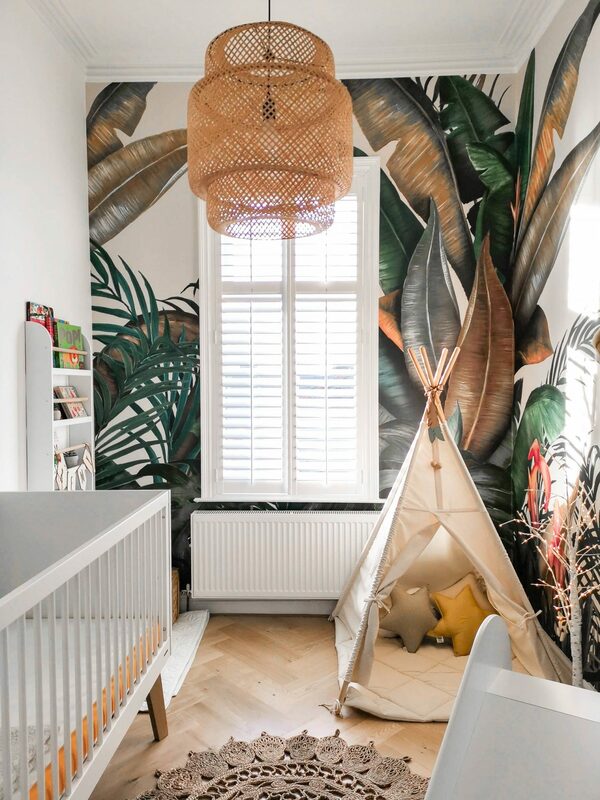 Hugo even wanted to add some of his own things in the room because in his own words ‘yes, let’s put the animals in the jungle room because that’s where they should live’. Bless him! Right I shall not blabber on too much longer though I need to share with you a little bit about each of the products I’ve either bought or have been kindly gifted so that you know where to find them too. Here are a couple of ‘before’ pictures so you can appreciate the transformation before I show you the rest! The shutters were gifted from California Shutters. They’re an online shutter company where you do all the measuring up yourself and they deliver. That did scare me a little because I was worried that I might have measured up wrong but they are really on-hand over the phone to ensure you’re measuring the correct areas and to make sure you choose the exact shutters you’re happy with. I then just got my DIY guy to come and install them for us. 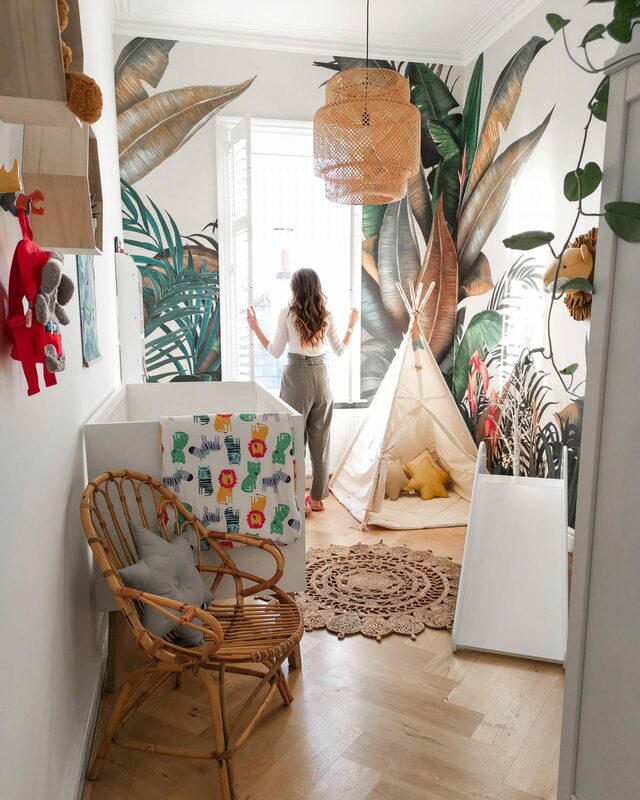 I feel like they have added so much to the whole look of the room and made the windows a feature point. It’s made me want them in all our bedrooms now as they block out most of light when they are completely shut but still allow it to feel really light when they’re open and obviously you still have the option of completely opening them to allow even more light in. For me I love that you can still have privacy with shutters but they still allow the light in and they look amazing adding so much style to the room too! Perfect for a child’s room. We chose the ‘parquet unfinished solid wood flooring’ . Use code SFFREE to get FREE delivery! 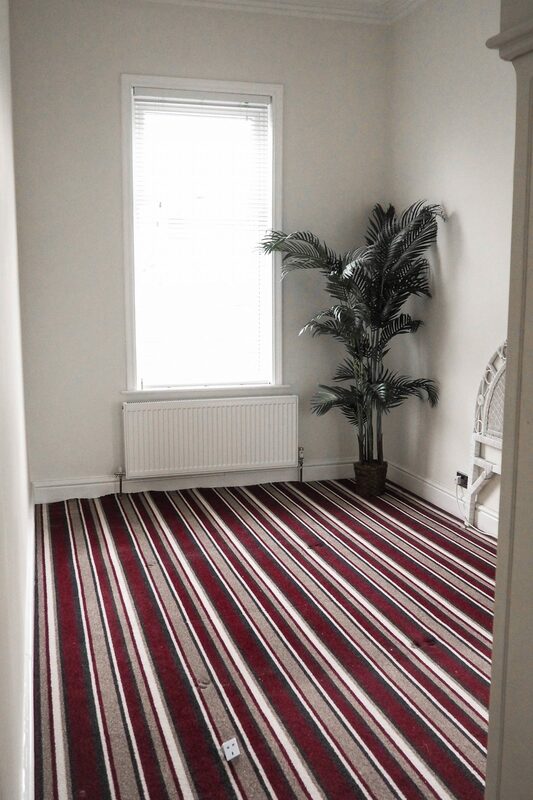 They were a dream to work with from choosing the style we wanted to making sure we had the correct underlay and the right person to fit it all for us. They delivered really quickly and were the kind of delivery men that go over and beyond to make sure you’re happy with everything and brought it all inside for us no problems. 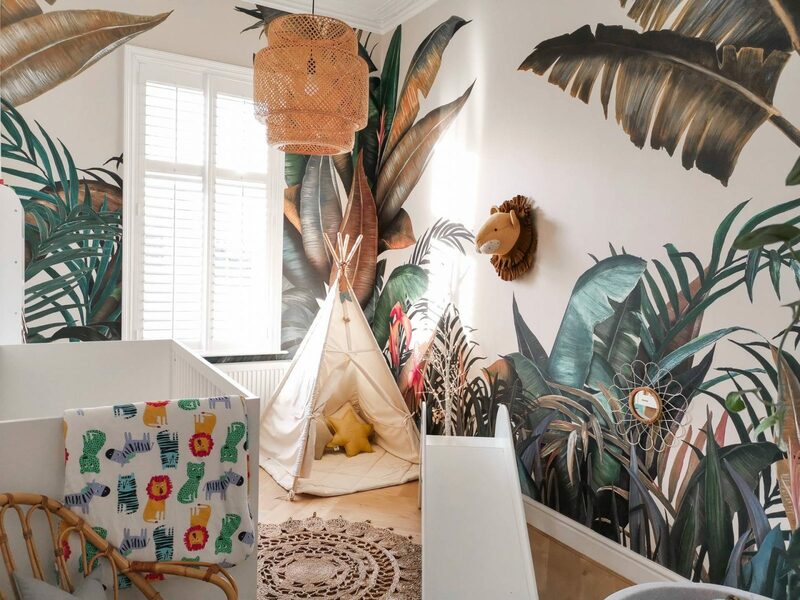 I feel like I don’t really need to explain in words the impact this wallpaper has had as you can see for yourself just how much it brought the whole room to life! We are thrilled with it and it makes it such a magical and imaginative space for the boys to play in. The wallpaper went on really easily and everything was numbered clearly so you knew which piece went next. 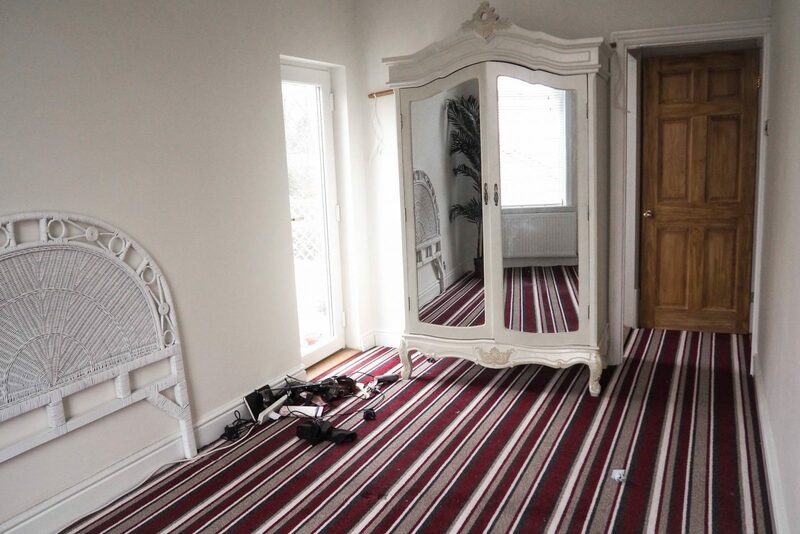 I ended up using the same DIY guy to do all these jobs; putting the flooring down, doing the wallpaper and decorating and fitting the shutters too. If you’re in the North West and looking for someone then this is the link to Michael’s page Parry Painting and Decorating. The wooden ark is from Names In Frames. This is actually Hugo’s and his grandparents gave it to him for his 2nd birthday and since that day he has played with his animals every day! My mother-in-law actually sells them so I have linked the small version and this version on her website, they’re fair-trade too and have the most beautiful wooden animal collection which are very hardwearing too :). 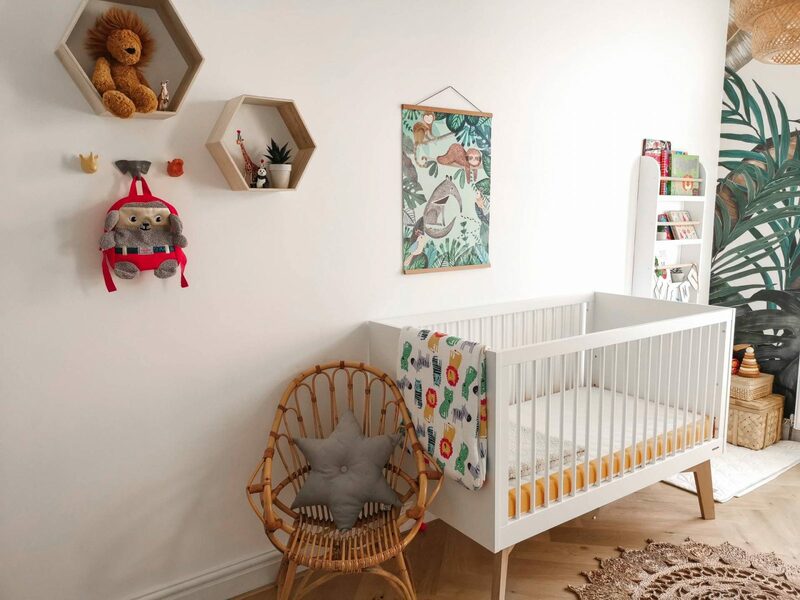 The cot is from Kidsmill (gifted) – a gorgeous Danish company. It also comes with a lower side panel that I can put on when it’s time to turn it into a big boy’s bed. Not any time soon though I hope :). 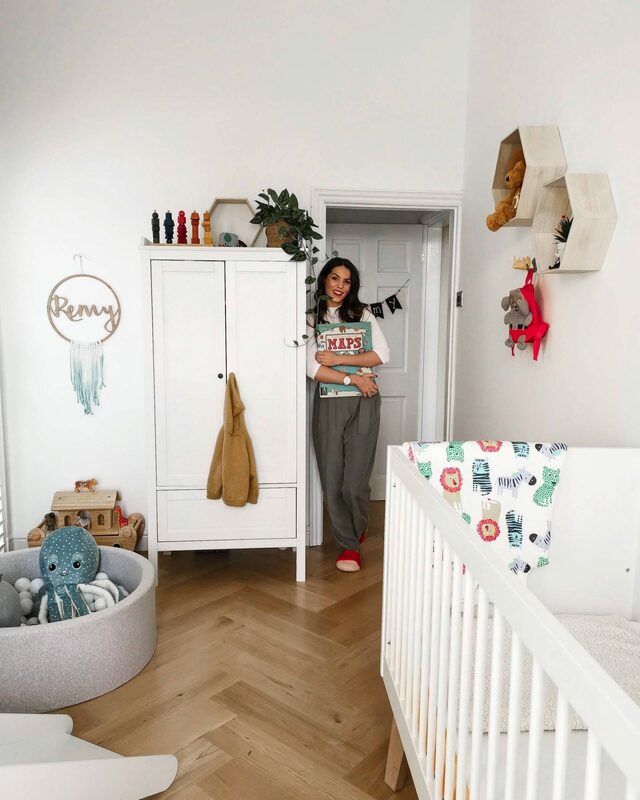 Cot bed mattress from Eve Sleep (gifted) – this is so comfy and supportive for Remy; it’s an award-winning mattress and that doesn’t surprise me, it feels really premium. Animal hooks were from Futon but I can’t see them on there now but there are similar here. Sloth animal print from Psikhouvanjou. Star cushion from Cam Cam Copenhagen. Animal grow bag from M&S (affiliate link). So there we have it! I hope you like the end result. If you have any more questions then feel free to leave below. I’m excited to see how this room will keep evolving over the years. Thank you so much for stopping by and have a lovely week!